New research suggests that cleanliness routinely comes top in guests’ feedback about hotels and guesthouses. P&G Professional, the away-from-home cleaning arm of Procter & Gamble, has teamed up with hotel search website trivago to help determine the impact that cleanliness has on a guest’s willingness to review positively and, in turn, to recommend a given establishment. 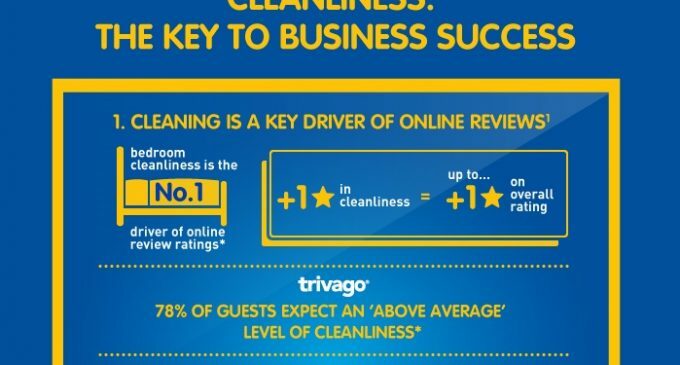 Likewise, results from trivago’s Quality Test – a mystery guest programme in which real guests receive a cash incentive for filling in a questionnaire regarding their stay – shows that 78% of guests expect an above average level of cleanliness, and that if they rate a hotel as clean, they are more likely to give the hotel a high rating overall. So, while it is commonly understood that good online ratings boost the number of stays, the combined data clearly suggests that cleanliness is a crucial factor in securing positive recommendations and reviews. The research also shows that an increase of 1 star rating in cleanliness is likely to increase the overall rating by up to one star. From a revenue perspective, if a hotel increases its review scores by one star on a total rating of five, the establishment could increase its price by over 11% and still maintain the same occupancy or market share. Commenting on the findings, Denise Bartlett, UK Public Relations Manager at trivago, said: ‘We believe a hotel’s reputation should be based on the hotel’s strengths, and as feedback from our quality test has demonstrated, the cleanliness of a hotel plays a key factor in guest retention and can have a positive impact a hotel’s reputation. ‘With data from recent research indicating that over 60% of customers read online reviews before making e-commerce purchasing decisions, it’s likely that the very first impression a prospective guest has of a hotel is the opinion of a previous guest. For more information about P&G Professional, visit www.pgpro.co.uk.